Lynne Greene Interiors is a family-owned business, committed to your complete satisfaction. Our reputation in our community is important us, so you get a level of personal service you just won’t find anywhere else. Already know your favorite style? We’ll help you find the perfect furniture, shades, draperies, blinds, fabrics and other accessories to fit your vision – right down to the last candlestick. Not sure what you like yet? No problem! We’ll start by eliminating what you don’t like, and then we'll work with you to develop an interior decorating style that’s just for you. Get started today. As a Hunter Douglas Gallery, we carry a wide variety of high quality blinds, shades, and shutters to meet any window treatment need. We also offer the latest in window treatment motorization. 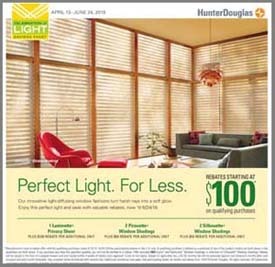 View our window treatment products. With our own in-house workroom, extensive fabric selection, and talented designers we create fabric window treatments, custom bedding, beautiful fabric accessories, and more! Get started with your custom fabric project.